SEATTLE (May 2, 2013)– Seattle Southside Visitor Services, the official tourism department for the cities of Tukwila, SeaTac, Kent and Des Moines, presented the 2013 Seattle Southside Tourism Ambassador award to the Seattle Southside Tourism Promotion Area Steering Committee at the Annual Tourism Networking Meeting last night. Scott Ostrander, General Manager, Cedarbrook Lodge. For the past several years Seattle Southside has honored individuals who do outstanding work for the Southside tourism industry. These Tourism Ambassadors go above and beyond the call of duty to support the tourism industry and our destination. This year is slightly different. Local hoteliers have been working on creating a Tourism Promotion Area for quite some time. A group of hoteliers formed a steering committee and they have been the driving force. In 2012, travelers spent $625.7 million in Seattle Southside. That’s an increase of 5.8% from the previous year. And it brought $63.8 million in local and state tax receipts. Employment grew by 4.6%, the strongest growth since 2005. There are now 5,240 jobs supporting the tourism industry in the cities of Des Moines, Kent, SeaTac and Tukwila generating $185.2 million in wages. None of it would be possible without teamwork. Seattle Southside succeeds as a result of partnerships with each city and with each industry sector. Tourism matters. Just ask our All Star Team of Ambassadors working together to create a Seattle Southside Tourism Promotion Area. With their powers combined they have the potential to increase travel and spending through targeted promotions and campaigns. These hoteliers welcome millions of guests to Seattle Southside each year and show them the true meaning of hospitality. Power in numbers indeed. The Tourism Ambassador program was developed as part of the Why Tourism Matters campaign created by Visit Seattle and Washington State Destination Marketing Organization. 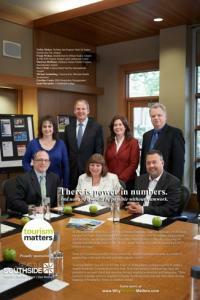 Seattle Southside Visitor Services (SSVS) is the leading tourism and marketing organization in South King County. The program, offered jointly by the cities of Tukwila, SeaTac, Kent and Des Moines, is responsible for competitively marketing the area as an ideal travel destination for tourists who wish to explore Western Washington. For more information, please visit www.seattlesouthside.com.